21 Days Naturopathy Program for Weight-loss | Case Study at Nimba Naturopathy Centre! Being Overweight? Looking for a relief from Obesity? Weight loss is not so easy, everyone knows it because being overweight can be the result of so many different causes and psycho-physiological conditions. Globally, the number of people seeking relief from Obesity and other related complications is rising fast. Naturopathy, however, can help to a great extent in losing weight. But it surely requires a systemic approach to weight loss. Naturopathic approach to weight loss doesn’t only focus on reducing the weight, but holistic health management. Naturopathy treatment for weight loss can help a person to attain optimal weight, robust health, and true wellness. And this all is evident from the recent case of a guest at Nimba Nature Cure Centre, let’s understand it. The Naturopathy Treatment for Obesity at Nimba Nature Cure Village is divided into three phases. Phase 01 focuses on diagnosis and tests to understand the root cause of the condition. Phase 03 focuses on controlling the weight with lifestyle and dietary changes. One of our recent guests was a young female suffering from obesity and other complications related to hormonal imbalance. 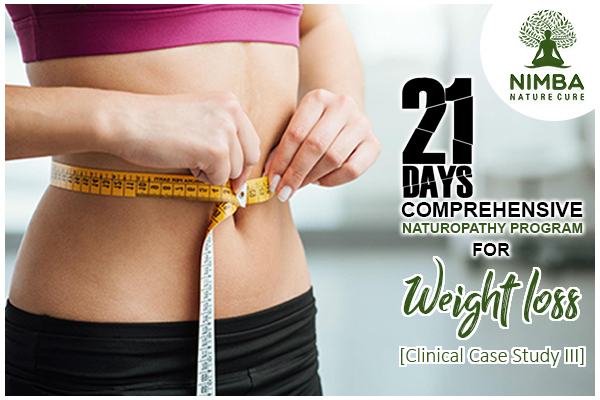 She opted for a comprehensive 21 days Naturopathy Program for weight loss at Nimba Nature Cure Village. She was hoping to reduce the weight and lose some inches as well. Naturopathy and other traditional medicine practices allow us to make a complete psycho-physiological profile of the client which we can study and detect the abnormalities. Starting from understanding the ‘Prakriti’[Body Nature Analysis] of the guest to their lifestyle & habits; from their past clinical history to their emotional wellness; we study everything to zero upon the real problem causing the overweight condition. In this case, the guest had no history of surgeries or genetic traits. The results showed being overweight was just the symptom; she was suffering from the hormonal imbalance which was the real culprit behind her obesity problem. Naturopathy treatment for obesity doesn’t focus on simply reducing weight but treating the body as a whole system. It focuses on correcting all the energy imbalances in the body altogether and addressing the root cause of the disease. Our guest was prescribed a special naturopathy diet plan for weight-loss, activities, and therapies to address the problem of hormonal imbalance. Also, the treatment focused on creating a lifestyle change and motivating the guest to unleash the utmost potential both mentally and physically. After the completion of 21 days Naturopathy Program for weight loss, the guest was advised about most healthy diet choices as per her body type. She has also suggested a daily routine with exercises, physiotherapy, and yoga for her regular daily life. Naturopathy and other lifestyle changes would allow our guest to regain the confidence and be in a better shape for the rest of her life. Practices like Surya Namaskar, meditation, etc. would work profound changes in her physical, mental, and spiritual health. And this would also help her maintain her weight in healthy limits. Within just 21 days, the guest could reduce her weight by 7 kilograms, which is a really remarkable feat. Also, at Nimba – The best naturopathy centre for weight loss in India, she got a chance to learn new techniques and habits which could help her manage her health easily. At a Naturopathy center for weight loss in India, such as Nimba Nature Cure Village, weight loss is done systematically and scientifically.